Have been actually promising. We finished WAI-tweaking at Maharanis and I think most parts of the site should be now WAI-AA. I just applied the Web Technologies Certificate from the IWA/HWG. This means I succesfully finished at least 5 courses focusing on the themes of Markup, Style and Accessibility. But other great news arrived at this front. I was very honored when they asked me to instruct one of their CSS courses. So I am happy to announce that I will be co-instructing the Intermediate CSS-Workshop with the fabulous Chimene Long. The next session of the course starts March, 1st. If you want to have a short description of what it is about, take a look at the Syllabus. I participated at the Word Press Style Competition. It was really great fun. 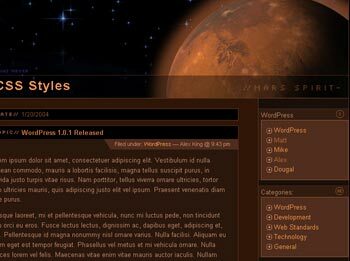 Due to its new popularity I chose the planet Mars being the main topic of my theme. Normally, I don't like the colour brown that much, so it was really difficult to find the right color combinations. But, it was a quick shot, and I am quite satisfied with the result. 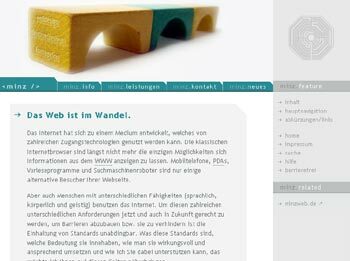 minz.info. The business page. This is hard, especially to come up with the right content. Do you find it also that tough to write something about yourself? Hopefully, the site will be finished within the next week. I'll kepp you informed. Tauchtreff Neptun. This one was done during a night-session with a close friend of mine. 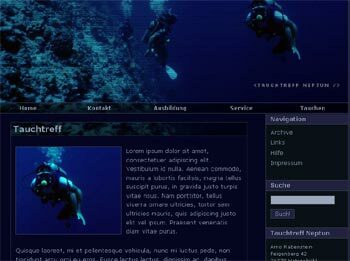 A page about scuba-diving. This is just a brief design-template. There is a weblog planned and I am looking forward to style the rest of the site. I just want to say thank you for the wonderful WordPress design. It is incredible. I am very new to WordPress and I found your design while browsing looking for interesting things to do with it. I've applied it to my site and I am putting a link in to you. Thank you.